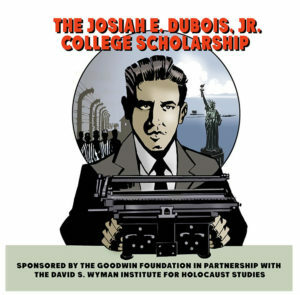 The David S. Wyman Institute for Holocaust Studies teaches the history and lessons of America’s response to the Holocaust, through scholarly research, public events, publications, and educational programs. Based on the research of Professor David S. Wyman concerning America’s response to Nazism and the Holocaust, the Wyman Institute focuses on the abandonment of Europe’s Jews during the Nazi era, the efforts to promote rescue, and the moral and historical lessons of those experiences. The Wyman Institute strives to bridge the gap between the scholarly community and the general public, by making the historical record accessible to a broader audience through exhibits, speakers, educational curricula, and other forms of media. The Institute brings together a politically, religiously, and culturally diverse group of concerned individuals and scholars, who share a commitment to the importance of studying, documenting, and publicizing the lessons of America’s response to the Holocaust. Institutions listed for identification purposes only.